Stephen P. Turner, Cognitive science and the social. A primer, New York, Routledge, 2018, 238 p., ISBN : 9780815385691. The rise of cognitive neuroscience is the most important scientific and intellectual development of the last thirty years. Findings pour forth, and major initiatives for brain research continue. The social sciences have responded to this development slowly--for good reasons. The implications of particular controversial findings, such as the discovery of mirror neurons, have been ambiguous, controversial within neuroscience itself, and difficult to integrate with conventional social science. Yet many of these findings, such as those of experimental neuro-economics, pose very direct challenges to standard social science. At the same time, however, the known facts of social science, for example about linguistic and moral diversity, pose a significant challenge to standard neuroscience approaches, which tend to focus on "universal" aspects of human and animal cognition. A serious encounter between cognitive neuroscience and social science is likely to be challenging, and transformative, for both parties. Although a literature has developed on proposals to integrate neuroscience and social science, these proposals go in divergent directions. None of them has a developed conception of social life. This book surveys these issues, introduces the basic alternative conceptions both of the mental world and the social world, and show how, with sufficient modification, they can be fit together in plausible ways. The book is not a "new theory " of anything, but rather an exploration of the critical issues that relate to the social aspects of cognition which expands the topic from the social neuroscience of immediate interpersonal interaction to the whole range of places where social variation interacts with the cognitive. The focus is on the conceptual problems produced by any attempt to take these issues seriously, and also on the new resources and considerations relevant to doing so. But it is also on the need for a revision of social theoretical concepts in order to utilize these resources. 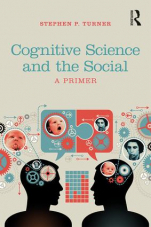 The book points to some conclusions, especially about how the process of what was known as socialization needs to be understood in cognitive science friendly terms. But there is no attempt to resolve the underlying issues within cognitive science, which will doubtless persist. Stephen P. Turner is Distinguished University Professor at the University of South Florida. He has written on issues of cognitive and social science since the 1980s, incorporating philosophy and science studies in related areas, and publishing two collections of articles on these topics: Brains/Practices/Relativism and Understanding the Tacit, as well as a number of other articles and chapters. Dr. Turner is the author, co-author, editor, or co-editor of twenty-five other books.